Last year, NT Thunder hosted Brisbane in the opening round of the NEAFL season and won. Optimism was high for finals and even, just maybe, a premiership year, but as the season progressed, that optimism proved to be misplaced. It just goes to show the old adage, one game at a time, is sometimes sage advice. Thunder’s second last finish on the NEAFL ladder wasn’t for a lack of trying, but for whole quarters at a time, it seemed Thunder was overpowered by bigger, stronger opponents who managed to get a run on that the Territory side just couldn’t stop. This year, the Thunder hierarchy is hoping that will change. Last season’s coach Andrew Hodges has moved into a club management position with South Australian Darren Reeves taking his place and a number of big bodied players with the skills to play, both in key positions or on the ball, have been brought in with the specific aim of matching it with the bigger teams of the competition. Players like former Fremantle ruckman Jack Hannath, SANFL Reserves Magarey medalist Jacob Templeton and NTFL stars Nathaniel Parades and Clinton Gallio. The versatile club legend Cameron Ilett has retired and there’s change afoot in the forward line as well with champion goal-kicker Darren Ewing retiring and the mercurial Adam Sambono not returning. That gives the likes of Will Farrer, Dean Staunton, Kieran Delahunty, Adam Tipungwuti and the NTFL’s leading goal-kicker Trent Melville their chance to write their own stories. Reigning Ilett medalist Abraham Ankers steps up from vice-captain to join Shannon Rioli as a co-captain and they’ll be supported in the leadership group by Hannath, Joe Anderson and reigning NTFL Nichols Medallist and premiership player Phillip Wills. Then there’s the retuning big names in McLean, Weetra and Yarran and the exciting additions of NTFL stars Josiah Farrer and Sam Talbot while X-factor Ross Tungatalum and Centralian Dylan Barry return after time away from the club. Reeves said his first pre-season has coach of the Thunder has been a big challenge, given most of his players have been playing NTFL footy until shortly before the season, but he’s impressed by the commitment of the players. “The players had outstanding buy in, doing their rehab and doing the work they need to do, doing their recovery work and then the education side of how we want to play and the areas we wanted to improve,” Reeves said. Reeves said, although last season’s result showed the team needs to improve its defensive side, he’ll still back the players to play the Territory style they’re known for. “I just like guys who like to take the game on without fearing mistakes and we’ve got a lot of players up here,” he said. As all the AFL clubs do, Brisbane will provide a huge first-up challenge for Thunder. Having trained together for months ahead of the season proper and on the back of a 50-point victory over Gold Coast in a trial game, the Lions will also be boosted by the form of their senior team. The first round of the NEAFL season will undoubtedly warm the hearts of Thunder fans, but not us much as the return of Kieren Parnell to competitive football. Parnell has been selected to play his first game in three years after two knee reconstructions. Shannon Rioli said Thunder will have to be at its best to get the season off to a similar start as last year. Reeves agrees that the Lions will have plenty of talent to call on. 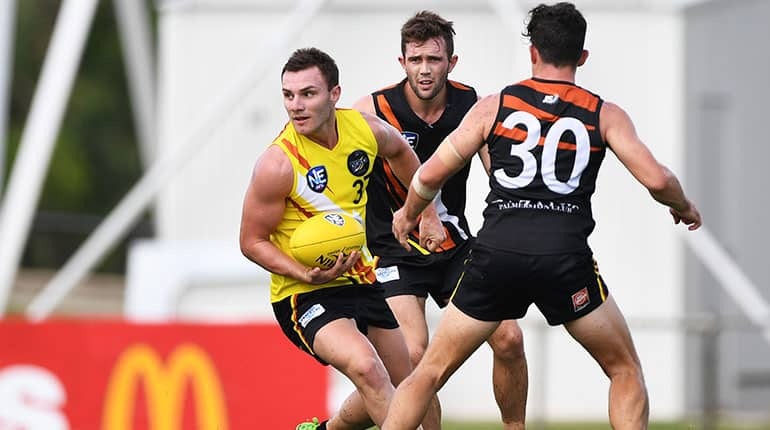 “At a coach’s dinner last week, their coach Mitch Hahn mentioned they had 22 (AFL) listed players play in a trial game the weekend before and they don’t have too many injuries so we expect they’ll come to Darwin with a really strong reserves list. “They’ll be young too, they’ve got a lot of newly drafted players as well. It’s going to be a challenge obviously. Every time you play an AFL club it’s a challenge, so it’ll be a nice challenge for us, but we feel that if we can do things really well long enough we’ll be right in the contest late in the game.